A timeless classic that doesnt follow the trends, the Torrence is a model of enduring style with its Provence Crackle finish and rich Amber glass. This performer sets a new standard for air movement in fans of its size and the included 5 Mahogany / Dark Walnut Reversible Veneer blades are sure to fit most decors. 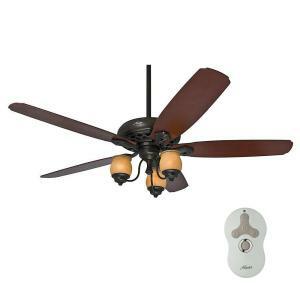 Tbook.com crawls the web to find the best prices and availability on Hunter Fanss and related Tools and Hardware products like Hunter Torrence 64 inch Indoor Provence Crackle Bronze Ceiling Fan with Light Kit with Remote Control. For this page, related items include products we find that match the following keywords: "Hunter Fan" at our vendor partner Home Depot. Hunter Torrence 64 inch Indoor Provence Crackle Bronze Ceiling Fan with Light Kit with Remote Control is one of 151 Hunter Fanss and related products listed in the Tools and Hardware section of Tbook.com If you have any questions on this product, please give us a call at 734-971-1210 during the hours of 9am - 5pm EST for assistance. Thank you for shopping at Tbook.com, the Internet Department Store!